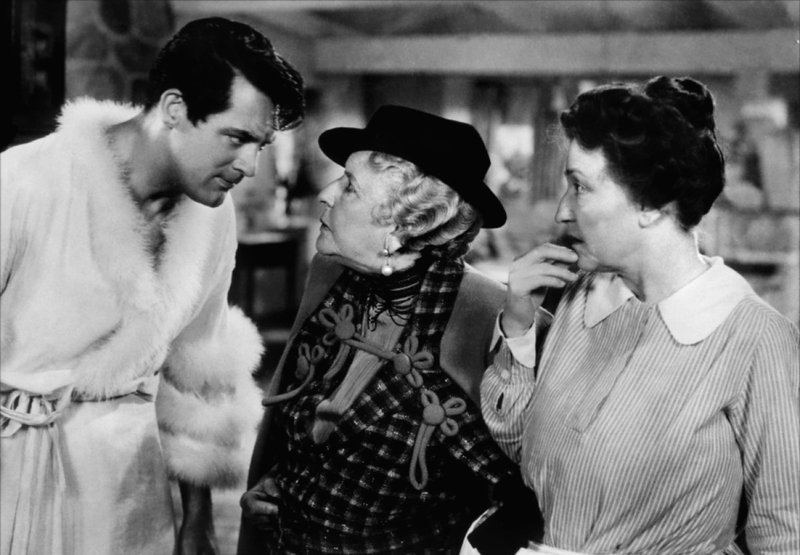 A classic screwball comedy, Bringing Up Baby throws dinosaur bones, two leopards, one dog, cross-dressing, torn cocktail clothes, a million dollar grant, and an unlikely romance onto the screen, and makes it all work. Paleontologist Dr. David Huxley (Cary Grant) is slightly eccentric and a bit stiff, but he is about to get married to his assistant Alice. David's crowning achievement is almost complete: he has reassembled a massive Brontosaurus skeleton, and receives the good news that the final missing bone has been uncovered at an archeological dig and is being delivered. He is also anxious to seal a commitment for a $1 million grant to his museum, which requires him to play a round of golf with the donor's lawyer. On the golf course, David's life changes in an instant: he crosses paths with Susan Vance (Katharine Hepburn) a fast-talking, strong-willed, and single-minded woman. Not only is the golf game disrupted, but Susan makes sure that all of David's plans are spun out of orbit: the chances of securing the donation, the impending marriage, and the precious bone become casualties of the Susan storm, which includes first one and then two leopards on the loose and one feisty dog that loves large bones. As David transitions from indignation to resignation, Susan has her eyes set on the unlikely goal of winning his heart. Howard Hawks directs with the accelerator firmly on the floor, the action and comedy simply hectic. Once Susan makes her appearance, Bringing Up Baby is caught in the tornado of a woman quite willing to throw all of David's life up in the air in order to rearrange the cards in her favour. The contrast between Susan's courage to create and thrive in chaos and David's cautiously scientific approach to life is at the centre of their tumultuous relationship. Hepburn brings Susan to life as a woman who talks at a hundred miles a minute, thinks even faster, and leaves David trailing in her wake and with no choice except to follow. Grant creates in David a scientist comfortable only within the confines of his museum, and even then just barely. Everywhere else David is ever so slightly hesitant, with signs of absent mindedness and lack of confidence, and the knack of saying the wrong thing at the wrong time. In short, a man most in need of a strong woman in his life, but who does not yet know it. The supporting cast is steady without being stellar. Mary Robson is Mrs. Random, the wealthy woman looking to make a $1 million donation who unexpectedly appears when David is least ready for her. 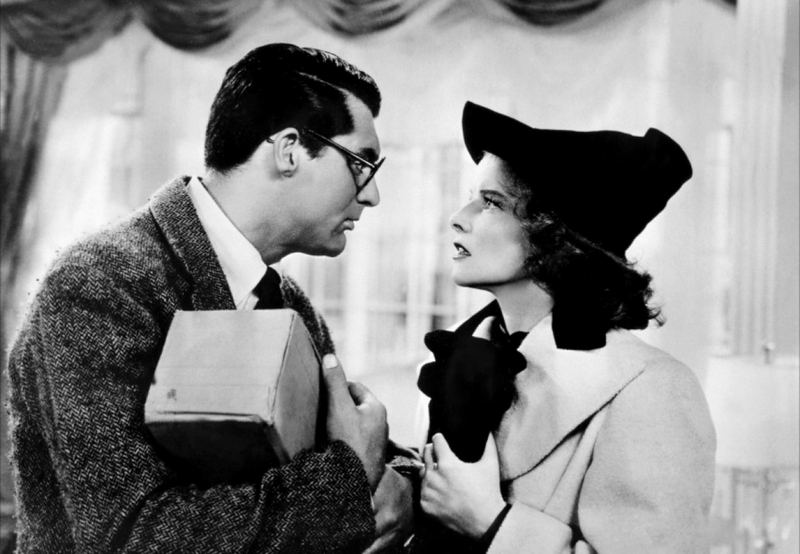 George Irving is her lawyer Peabody, left stranded on more than one occasion by David's bumbling attempts to keep up with Susan. And Charles Ruggles appears as the bombastic Major Applegate, a big game hunter and a man exactly opposite in personality to David. The fun with the two leopards, one the friendly Baby of the title and the other a lot less cuddly, is comedy at its finest, building to a quite hilarious frenzy involving the police, zoo keepers, and a crowded jail house. Bringing Up Baby is a sharp comedy of opposites attracting, and while leopards can't change their spots, they can certainly help to spot an unlikely romance.